Our guest speaker will be Amy Sonnie, activist, educator and librarian who has worked with U.S. grassroots social justice movements for the past 17 years. Amy will discuss her acclaimed YA anthology Revolutionary Voices (listed by ALA's Office of Intellectual Freedom as one of 2010's Most Frequently Challenged Books), and her forthcoming Hillbilly Nationalists, Urban Race Rebels, and Black Power: Community Organizing in Radical Times, a history of poor and working-class whites, inspired by the Civil Rights Movement and the Black Panther Party, who organized significant political movements against racism and inequality during the 1960s. The discussion will touch on lessons from this history for librarians and progressive scholars today. Tributes to Activist Filmmaker Helen Hill – The Video Round Table offers the program “Filmmaker Helen Hill: Animation, Activism and Recovery,” at MCC-353 on Sunday, June 26 from 10:30 a.m.-12 p.m.
Helen Hill’s tragic murder post-Hurricane Katrina has inspired fellow artists and librarians to preserve her legacy. After her films and materials were damaged in the flood, Hill engaged with techniques of archiving and restoration. Join the Video Round Table for a panel discussion on award-winning filmmaker of experimental animation and local New Orleans community activist, Helen Hill. This event is co-sponsored by VRT and ACRL-ARTS; co-sponsored in name only by ALCTS-PARS and SRRT. Additional tribute to Helen Hill and her work will be made at the Video Round Table's Gala on Sunday, June 26, 7:00-9:30 p.m. at the Zeitgeist Multi-Disciplinary Arts Center, 1618 Oretha Castle Haley Blvd. The event begins with hors d’oeuvres and cash bar from 7-8, followed by the program from 8-9:30 p.m. Tickets may be purchased in advance for $15, or onsite for $17. Purchase your tickets at the VRT Booth in the Exhibit Hall or from Gala Co-Chair, Danette Pachtner. Helen Hill was a social activist and artist of experimental animation who lived and created in New Orleans. After the devastation of Hurricane Katrina, Hill's work expanded into the preservation realm as she promoted do-it-yourself techniques for film archiving and restoration. Her films have received awards and honors, including entry in the Library of Congress’ National Film Registry. Join Video Round Table and friends of Helen Hill for an evening celebrating her life and work. Human Library – All are invited to check out a Human Book at the Human Library, to be held from 1:30 to 3:30 p.m. on Monday, June 27 at ALA’s Annual Conference in New Orleans. Volunteers will serve as “human books” and help attendees better understand people of different backgrounds and cultures. “Human books” are “checked out” for one-on-one, respectful conversations. This unique opportunity allows volunteers to raise awareness of the biases and prejudices that participants have themselves or hold against others. The program ultimately promotes appreciation for differences in background and culture. The Human Library (www.humanlibrary.org) is an outgrowth of a Danish anti-violence campaign. Since 2000, the movement has brought together people of different backgrounds to have meaningful dialogues, comprehend differences and seek common cause. Human Library programs have been hosted around the world, including Iceland, Australia, England, Brazil, Japan and the United States. To volunteer as a Human Book, or to suggest resources for the event, please contact Julie Winkelstein at 2011humanlibrary(at)gmail.com. This year as SRRT Coordinator has gone by so quickly for me that I feel I have only made a small dent in the hood of the juggernaut zeppelin that is ALA. As the social conscience of ALA, SRRT is like a navigation system that continually course corrects the association's tendency to cruise the middle of the road when the left lane is open for forward progress and the right lane is blocked for repairs. We have made some important strides this year, including: revising our bylaws; understanding and maintaining our small yet healthy fiscal outlook; bringing in younger, socially conscious librarians into the Action Council to complement veteran members; connecting with activists from other divisions and round tables; passing important labor, whistleblower, and anti-war resolutions and bringing those issues to the attention of ALA Council; sponsoring great programs at conferences; and continuing to fight for progressive issues that reside in or cross pollinate with socially responsible librarianship. This year in New Orleans I am proud that we bring a real American hero, though he undoubtedly shuns that moniker, to speak to ALA. Dan Ellsberg spoke and still speaks truth, exposing the lies of those who will stop at nothing to further the profits of the military industry. Please come to the Saturday evening showing of a documentary about Daniel Ellsberg's life and his gathering and dissemination of the Pentagon Papers, and his Sunday morning Sunrise speaker engagement, both co-sponsored by the Office of Literacy and Outreach Services, the Office for Intellectual Freedom, the Video Round Table, the ALA Executive Director, and the ALA President. Other superb SRRT programs at Annual include the always inspiring Martin Luther King Jr. Multicultural Idea Exchange on Saturday afternoon, the Progressive Librarians Guild meeting on Saturday afternoon, a collaborative effort with the Video Roundtable about radical New Orleans filmmaker Helen Hill on Sunday morning plus a Sunday evening gala, the always educational and fun Feminist Night at the Movies on Sunday night, and a new and intriguing “Human Library” program on Monday afternoon. Our annual membership meeting also takes place on Sunday from 3:30-5:30 p.m. and we welcome all members to show up with any issues or concerns you'd like to see the roundtable address. Please see the schedule of meetings and programs elsewhere in this newsletter and come out and support SRRT and its affiliates. I have thoroughly enjoyed serving as your Coordinator and hope my small effort to handle the logistics of SRRT have strengthened the round table's foundation. Our numbers have dwindled for a variety of reasons, but there remains a core of concerned Action Council members, Task Force chairs, and supportive members who believe we are a necessary and integral component of ALA. We must be careful not to become complacent, or abandon our mission to establish and propel the concept of social responsibility within ALA and librarianship everywhere. Right now most librarians are fighting for survival, for their jobs and their legislators' attention. Labor struggles are spurring more librarians to voice their support and indignation at privatization centered officials, and it is my hope that this will translate into a stronger intersection of librarianship and human rights. On the housekeeping side of business, there is news to impart. First, Myka Kennedy Stephens concludes her 3-year term as SRRT newsletter editor and web site manager after the annual conference in New Orleans. I want to thank Myka for bringing the newsletter up to 21st century web publishing standards, soliciting and organizing newsletter content, and for showing genuine skill and dedication to a web site technical overhaul that is long overdue. Action Council will be tasked with appointing her successor at our next round of meetings and Myka has graciously volunteered to help us by mentoring her successor to allow for a seamless transition. Secondly, at this writing we are devoid of a chair for the Alternative Media Task Force, and we are hoping to find a SRRT member willing to take on this important role. The AMTF has hosted an alternative publishers reception at annual conference for many years and has been an important networking caucus within SRRT, and I sincerely hope it will attract a creative and devoted person to help with its rejuvenation. If you are interested in chairing AMTF, please contact me as soon as possible. All of our task forces have seen a decline in participation, so I strongly urge SRRT members to join our task forces or even create new ones. Similarly, discussion on the SRRT (srrtac-l) listserv, as well as on ALA Connect, has been minimal compared to vivacious years past. Perhaps the members who are subscribed are too overwhelmed with other priorities. This is not meant as criticism, just an observation that the round table is somewhat dormant in its collective energies at present. We hope that our recent decision to eliminate dues for students (effective September 1, 2011) will assist us in growing our membership and ultimately recapturing our status as the largest round table. Once again, thank you for allowing me to serve as your coordinator. I leave you in good hands as Jane Glasby takes over the Coordinator reins and I can begin to focus on advocating for socially responsible policies and practices on the floor of the ALA Council. It is an honor to have been elected as an ALA Councilor and I hope I will represent the interests of SRRT admirably. I am privileged to continue in SRRT Action Council for 2 more years and will continue to stoke the boiler in the SRRT engine room as well! On the month marking the fortieth anniversary of the first publication of excerpts from the Pentagon Papers, the ALA conference in New Orleans will celebrate freedom of speech and free access to government information with two exciting events. The first will be a showing of the 2010 Oscar-nominated documentary “The Most Dangerous Man in America: Daniel Ellsberg and the Pentagon Papers” on Saturday evening, June 25, 6:00-7:30 p.m. in Auditorium C of the Convention Center. We are working on arrangements for a discussion period immediately following the film in nearby Auditorium A. The second event will be a presentation by Daniel Ellsberg on Sunday morning June 26, 2011, from 8:00 a.m. until 9:15 a.m. in the Convention Center, Auditorium B. In June 1971, when the U.S. was locked in a seemingly endless war in Southeast Asia, Daniel Ellsberg played a central role in transforming the situation. Previously, Ellsberg had been a strategic analyst at the RAND Corporation, a consultant to the Defense Department and the White House, and had worked for the State Department in the US Embassy in Saigon. In 1967 he became a member of the McNamara Study Group, which produced the report on U.S. decision making in Vietnam that eventually was to become known as the Pentagon Papers. Disillusioned with the war, and disturbed by the decades of lies used to justify it, in 1971 Ellsberg provided copies of the report to the Senate Foreign Relations Committee, and then to the New York Times, Washington Post, and seventeen other papers. For that, Secretary of State Henry Kissinger denounced Ellsberg as “the most dangerous man in America” who had to be stopped at all costs. However, in a landmark decision the Supreme Court upheld the freedom of the press by ruling in favor of the right of the New York Times and the Washington Post to publish the Pentagon Papers. At the same time, the release of the papers fueled the growing public opposition to the war, which—together with the fierce resistance of the Vietnamese—ultimately compelled a U.S. withdrawal from Vietnam. And in 1973 Ellsberg's trial on twelve felony counts was dismissed on grounds of governmental misconduct against him. Anniversaries aside, the timing of these two programs could hardly be more appropriate. Currently embroiled in another series of conflicts, the U.S. government is now preparing to prosecute Pvt. Bradley Manning for allegedly revealing classified information about U.S. misdeeds, war crimes, and cover-ups; and it is considering prosecution of the news resource WikiLeaks for distributing this information. Undoubtedly, these issues will be addressed by Daniel Ellsberg, who has been an outspoken supporter of WikiLeaks and Bradley Manning. SRRT’s International Responsibilities Task Force would like to thank everyone who has made these programs possible. Seymour Wishman, President of First Run Feature Films, has been kind enough to make “The Most Dangerous Man in America” available to us. ALA sponsors and contributors to the two programs include the ALA Executive Director, ALA Office of Intellectual Freedom, ALA President’s Office, the Office for Literary and Outreach Services, the Social Responsibilities Round Table, and the Video Round Table. The program was enthusiastically endorsed by former ALA presidents John W. Berry, Carol Brey-Casiano, Leslie Burger, Mitch Freedman, Michael Gorman, Nancy Kranich, Lorienne Roy, Pat Schuman, Peggy Sullivan, and Betty Turrock, as well as by current ALA president Roberta Stevens. Finally, we want to express an especially big thanks to Al Kagan and Mitch Freedman for all their work in putting these events together. The SRRT Feminist Task Force (FTF) invites you to attend the Feminist Task Force meetings at the ALA Annual Conference. They are open to everyone. There are many opportunities for you including serving as an officer (coordinator, treasurer, secretary, etc. ), edit the newsletter Women in Libraries as a wiki, help plan programs, share ideas about things you would like FTF to do and other ways that you might design for yourself. We are always ready for new ideas. All FTF meetings and programs are highlighted below. You can find out what we are doing on our website, wiki and Facebook group. Event: Feminists Night Out @ ? Friday from 6:30 - 7:30+ p.m. The complete list of programs and meetings at the ALA Conference 2011 that may be of interest to FTF members and colleagues may be found at http://ftfinfo.wikispaces.com/Conference+Schedules. The meetings and programs are in order by day and time. Check out Women in Libraries for even more information. In Memoriam – We recently found out that Diane Kadanoff passed away on March 5, 2011. Diane had been an active member of SRRT and the Feminist Task Force for many years. She served as coordinator of FTF from 1976 - 1978 (http://www.libr.org/ftf/history.html). She was a past chair of the Committee on the Status of Women in Librarianship (COSWL). She served on ALA Council from 1989-1993, (http://ftfinfo.wikispaces.com/ALA+Council). There was a great description of her in one of the obituaries: An advocate for free speech who abhorred censorship in any form, she served as Director of the Norwell, MA Public Library for over 20 years. Active in the leadership of the American Library Association, an active feminist, poker player, and member of OLE, she leaves behind a legacy of laughter, good books, food, and love. She is another one of our leaders who will really be missed. A Memorial Resolution is being written for the ALA Annual Conference 2011. Women in Libraries, the newsletter of the Feminist Task Force is alive and well. It has program information, reviews of books and other media, and news items. Please check it out at http://ftfinfo.wikispaces.com/Women+in+Libraries. Any members of FTF may contribute to the newsletter. All you need to do is join the FTF wiki or contact Sherre Harrington, editor, at sharrington(at)berry.edu. Information on how to contribute may be found at the site. Also contact Sherre if you would like to review materials. Join the Martin Luther King, Jr. Holiday Task Force for its annual Multi-Cultural Idea Exchange, Saturday, June 25 at 1:30 p.m. in Convention Center room 334. Our featured speaker this year is Emmy Award-winning filmmaker and aesthetic realism consultant Ken Kimmelman. He is speaking on the topic, "Prejudice, Racism, and the Dream: Why It's Still Relevant," and showing his three short films: The Heart Knows Better ... human rights, Brushstrokes ... prejudice, and What Does a Person Deserve? ... homelessness. We will also be joined by Carolyn Neal, property management librarian at the Cleveland Public Library, who will lead our exemplary library exchange. Be prepared to share highlights from your library's activities and programs during our audience exchange and please bring 25 copies of any handouts you wish to share as part of our material exchange. The AMTF finds itself without a chair. All interested people are encouraged to contact SRRT coordinator Mike Marlin, or express your interest in person during the SRRT All Task Forces meeting, Saturday, June 25, 8:30 a.m. at the Convention Center, Room 240. The Alternative Media Task Force (AMTF) was formed in 2006 as a combination of the Alternatives In Publication Task Force and the Information Policy in the Public Interest Task Force. It is a group of library professionals that promotes alternatives in publishing and the acquisition of alternative publishers' materials in libraries; challenges media consolidation; and promotes critical analysis of communication policies and practices. We believe that the "Library Bill of Rights" is realized by providing access to a diversity of media, including those that lie outside the interests of commercial information providers. We are a subgroup of the American Library Association's Social Responsibilities Round Table, and therefore follow the charge of SRRT to "provide a forum for the discussion of the responsibilities of libraries in relation to the important problems of social change which face institutions and librarians." Members of the task force feel that protecting access to a wide range of information resources, even in the face of partisan and doctrinal objection or economic indifference, is a major responsibility of librarians today. Librarians are obliged to serve the public rather than the information industry. Those interested in the AMTF are encouraged to join us on ALA Connect: http://connect.ala.org/node/96642. When you go to New Orleans for the 2011 ALA Annual Conference, please drop by the TFOE Table at the annual All-Task Force Meeting of the Social Responsibilities Round Table on Saturday morning. This is going to be an important meeting as we talk about TFOE programs at the ALA Annual Meetings in 2012 (Anaheim) and 2013 (Chicago). We have been approached for a TFOE sponsored program with PLA (Public Library Association) for the 2012 Annual Conference, and there remains an interesting program that SRRT's TFOE and AIP are discussing about environmental and nature-themed books and education initiatives for children and young adults. If there is an issue you plan to discuss, please contact Fred Stoss, immediate past-Chair of TFOE, who moderates this year's discussions. Teaching environmental or outdoor education effectively at any grade level requires some patience, qualitative skills, and effective, economic and equitable access to data and information. The National Science Digital Library (NSDL; www.nsdl.org) fills a tremendous void with a treasure trove of resources to assist teachers and educators, parents and caregivers, students, and librarians in K-12 and college settings. The (U.S.) National Science Foundation developed the NSDL as an "online library of resources and collections for science, technology, engineering, and mathematics education and research." The resources provided include images, video, audio, software, datasets and textual resources (e.g., lesson plans, curricular guides and documents, journal articles). A search feature allows you to access a multitude of resources on the environment, energy, ecology, natural resources, and related topics. Additional features allow users to blog, search, set up a collaborative workspace for collection management, news updates and reports, and "community" discussions. After five years of delivering training and other support services for education professionals, the highly effective Third Environmental Education and Training Partnership (EETAP3) ended February 28, 2011. Highlights of EETAP3's achievements and other final products will be posted on the EETAP website: http://eetap.org/. The award winning documentary film/DVD, Kilowatt Ours: A Plan to Re-Energize America, a project of Trust for the Future, and perennial entry at various film festivals is a tremendous vehicle promoting the concept I call Environmental ICE: Information, Communication, Education. This DVD covers an area of increasing concern to homeowners and renters, neighborhood and community advocates: green and smart energy practices. Kilowatt Ours should be required viewing for every state and Federal legislative body, planning board, energy research and development authority, as well as public and private energy companies' PR and outreach divisions. Filmmaker Jeff Barrie explores some of the means by which our electricity is provided to a large and growing consumer base demanding more energy. Ramifications and consequences of this growing energy demand range from mountaintop removal mining, increases in childhood asthma, and global climate change. He and his wife, Heather, then provide a series of energy conservation, energy efficiency, and renewable energy actions--all of which are elements of a smart energy strategy that saves money, resources and the environment. Kilowatt Ours is one of the best films available on the topic of energy conservation, and has helped hundreds of thousands of viewers cut energy costs and live with a smaller energy footprint. You can preview it for free and you can start a new path for Energy ICE, by laying out strategies, actions, and policies that Inform, Communicate, and Education individuals, community leaders and civic groups. You find many of the answers at www.KilowattOurs.org. Issue 30 of the Electronic Green Journal (ISSN 1076-7975; TFOE Chair, Maria Anna Jankowska, Editor; TFOE past-Chair, Fred Stoss, Managing Editor) published an exciting paper, "Posters about Ecology and the Environment Before and During the 1970s," by Lincoln Cushing of the Oakland Museum of California. You access the article at http://escholarship.org/uc/item/8xc252jv. By clicking on the "Supporting Material" link in the left column, you find access to large versions of the posters. In the same issue, Nowacka, Izabela, Poznan University of Economics, Poland, provides “Earth Day 2010: Earth Day 40th Anniversary Poster: http://escholarship.org/uc/item/1r13740m#page-2. The HHPTF nears completion of their toolkit on hunger, homeless and poverty. This toolkit enables library workers to effectively serve poor patrons and enhance library services overall. The toolkit helps library workers understand poverty's ill effects on communities and how inclusive programs and services help everyone in the community. Community partnerships are emphasized, along with social service agencies. For more information, email Lisa Gieskes (lisagieskes(at)yahoo.com), HHPTF Coordinator. The Rainbow Project, a booklist of glbt-q books for young people birth to age 18, is thrilled to announce their new website. You can find nominations and all of our lists at http://glbtrt.ala.org/rainbowbooks. So far this year, we only have a few nominations, but we are busy reading as new books trickle in. Please visit our website throughout the year and keep tabs on what is new in glbt-q publishing. Also, you can check out lists from previous years (perfect for gift giving!). If you come across any books that you feel should be considered, please send title and author information to Lynn Evarts at LEvarts(at)aol.com. The books must positively represent glbt culture and have a publishing date between July 2010 and December 2011. The SRRT website has more than a fresh look. It is completely updated, reorganized, and full of new features! If you haven't already done so, we invite you to explore our "new" site. Resolution Archive: All SRRT resolutions recorded in the SRRT Newsletter are now indexed in our Resolution Archive. Site-wide search feature: Powered by SiteLevel, our site is now fully indexed and searchable. Options are available to search the entire site, newsletters only, or resolutions only. Search results are accompanied by ads that we unfortunately do not have control over. Order SRRT T-Shirts: A T-shirt order form is conveniently linked on our home page. Action Council Photo Directory: Photos of all Action Council members and liaisons now accompany listings in our directory. The SRRT Editorial Board has completed our search for a new Newsletter Editor, to replace out-going editor Myka Kennedy Stephens. We received applications from a number of qualified and impressive individuals and are pleased to announce our recommended candidate for this position. She's Amy Honisett of Salt Lake City, UT, who is a SRRT member and Education Librarian at the Spencer S. Eccles Health Sciences Library, University of Utah. She has an MS-LIS from Drexel University and an MA in English from Portland State University. Amy has experience with writing and editing, and an enthusiasm for the work and values of SRRT. As part of her application, Amy wrote: "I am very interested in the work of the SRRT; I decided to become an information professional because I feel strongly that everyone deserves the opportunity to access information. I believe that the homogenization of information resources is a danger to democracy and an obstacle to individual intellectual growth. I would like to do my part to support an organization that works towards greater democracy and social responsibility." Amy and Myka have begun collaboration on newsletter activities in anticipation of Amy taking on editorial responsibilities following ALA Annual Meeting in New Orleans. A seventh edition of Alternative Publishers of Books in North America (APBNA) has been published by the Counterpoise Collective. There will be a review of it in the final issue of Counterpoise magazine, which is coming out in June. SRRT Members might want to note the creation of the new archival collection of Women for Human Rights and Dignity (WHRD) at Canisius College in Buffalo, New York. The Buffalo News recently published an article about the collection. Creating such an archive will greatly improve scholarship and policies related to the rights of women. It is important for librarians to share this information nationally and globally. Designing Effective Poster Presentations – SRRT Member and long-time TFOE leader, Fred Stoss, maintains an interesting Webguide, “Poster Presentations Designing Effective Posters http://library.buffalo.edu/libraries/asl/guides/bio/posters.html that should be of great interest to other SRRT members, and hope that you will share this information with your colleagues from local to national to global levels. This guide provides an inventory of print and Internet resources that provide guidance and instruction for the presentation of scientific and technical information in the form of a poster presentation. This guide includes information resources in the forms of journal articles, books, book chapters, and Internet sites that focus on the planning, design, construction, and presentation of a scientific poster. Please feel free to create a link from your own pages to this and suggest this site to others, especially if you are planning or organizing a poster session for a professional meeting where quality posters are sorely lacking. This is my last issue as editor of the SRRT Newsletter, and the last three years have been an incredible journey for me. I came into this volunteer position with some editing experience, a passion for social justice, and only vague ideas of how social justice relates to librarianship. It was my hope that I could offer my talents as an editor and a writer to this round table in return for learning more about what it means to be a socially responsible librarian and to practice socially responsible librarianship. I feel that all I have given through my time and energy has been paid back in full. The Social Responsibilities Round Table is a remarkable organization led by strong, principled and passionate librarians who care deeply for human rights, freedom of information, equal rights for all, and strive to incorporate these beliefs into the work of libraries and the American Library Association. Working on making the archive of the SRRT Newsletter available online as well as creating an online archive of SRRT resolutions provided me with a fascinating glimpse into the heart of this round table and how it developed over the years. Like every group, SRRT has had its share of successes and dark times, yet always continues on the quest to bring about a better tomorrow through activism on a broad range of social issues. In the last six weeks I spoke with two classes about my experiences as a librarian. One was a capstone class of MLIS students preparing for graduation at Dominican University. Much to my dismay the vast majority of the students were not members of ALA, although many were already working in libraries and had hopes of continuing in the same libraries or other library positions. Armed with SRRT brochures, I spoke of the importance of being connected to a professional association, the opportunities it provides, and particularly of the crucial role SRRT plays within ALA. We discussed how social issues do inform and impact our work as librarians, and how being involved in SRRT provides a community of support and educational opportunity on topics and issues of social responsibility. The second class I spoke with was my son's pre-Kindergarten class. Anyone who has addressed a class of four- and five-year-olds will know that this is no easier than speaking to a class of graduate students. As one of several parents who came to speak as part of “career week,” I tried to explain that librarians do more than shelve books or manage the toys and games in the children's section. Going through the list of library positions, from reference librarians to catalog librarians, I shared how each person working in a library is there to help us find the information we seek. Any question a child may have—from sports to dinosaurs, from geography to astronomy—can be answered because of the care and dedication of librarians to make information easily accessible and available to all. Speaking with these classes further strengthened the connections in my mind between librarianship and social responsibility. The two are nearly inseparable as social responsibility is inherent in the core purpose of librarianship. Our field desperately needs organizations like SRRT who are committed to preserving the social mission of librarianship and ensuring unbiased access to information. Even more, we desperately need the support and involvement of librarians dedicated to social justice and social responsibility. Over the past three years the SRRT Newsletter has become an online publication, integrated into a website that serves as the virtual repository for a collection of newsletters, resolutions, and other historical documents that witness to this round table's strong commitment to social responsibility. It has been an honor to work with the dedicated volunteers that lead SRRT. I would especially like to thank members of Action Council for their cooperation and support when I have sought submissions for the newsletter, members of the SRRT editorial team for their unfailing support and encouragement, Kathleen de la Pe�a McCook and Katharine Phenix for their help with archiving SRRT Resolutions and the SRRT Newsletter, as well as Sanford Berman for his supply of news clips and letters reflecting on social issues and librarianship. Although this may be the end of my editorship, it is only the beginning of SRRT's influence over my work and understanding of librarianship. As I shift my energy and focus onto my own projects, I will carry with me new and clearer perceptions of what it means to be a socially responsible librarian. Thank you for the opportunity to serve, and thank you for reading. I hope that sharing my story and the stories of others through this newsletter will motivate and encourage readers to step forward, get involved, and make a difference in our profession through the Social Responsibilities Round Table. That libraries serve as champions of cultural rights in our global community is an often overlooked yet incredibly vital role for the institution. Indeed, cultural rights are considered a “neglected category” of human rights and are difficult for scholars to define. Beyond Article 19 emphasizes both the necessity and complexity of this human rights discussion, especially for the future of librarianship. The title of the book, Beyond Article 19, comes from the Universal Declaration of Human Rights (UDHR), a document created by the United Nations in 1948. Specifically, Article 19 states that “everyone has the right to freedom of opinion and expression.” The authors believe that for librarians to create a unified human rights perspective, one of the most important challenges for the field, they must look to the other articles of the UDHR and its related documents. Article 27 of the UDHR, “everyone has the right freely to participate in the cultural life of the community, to enjoy the arts, and to share in scientific advancement and its benefits,” seems best suited for this task. In the first essay, “Symbolic Possibilities,” author Julie Biando Edwards describes the library as the “heartbeat” of a community. More than a collection of books, the library is a place of action, where the collective memory of a community is conveyed through library programming (ethnic storytelling, craft workshops, music performances) and a spirit of cultural equality. By acting as an agent of culture and promoting cultural activities within a community, the library becomes a symbol of culture valued by the people. 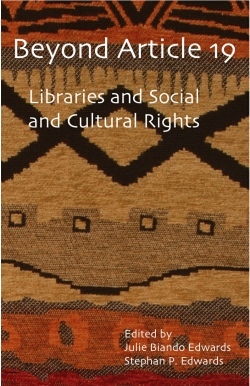 Other authors are quick to note that libraries have a difficult task in ensuring proper implementation of cultural rights. In Natalia Taylor Poppeliers'' essay about librarianship in Africa, she warns, “To many Africans in the post-colonial nations, the image of the library was inherently connected with colonial rule.” Oral traditions and native artworks were often ignored in lieu of “proper” Western practices. As one example, a library creating a local history database is not a novel idea, but rather a computerized version of oral history, which dates back thousand of years. Back in the United States, authors Loriene Roy and Kristen Hogan share the trials of the past, saying, “A look at confluences of library and tribal histories suggests that librarians' contributions to national campaigns for individuals right have been at the cost of indigenous librarianship and cultures.” Even today, when most public libraries offer mainly popular bestsellers to their patrons, this waters down the culture of the institution and leaves minority cultures out in the cold. Beyond Article 19 engages the reader in a necessary discussion of human rights issues at the library. In its goal to “lay the groundwork for further inquiry,” the books invites the reader to consider these rights in their own circumstances A recommended addition for any university library and a worthy read for any practicing librarian. More information can be found at the publisher's website: http://libraryjuicepress.com. Woman Rebel. Dir. Kiran Deol. Woman Rebel Films, 2010. Film. Nestled snugly between China and India, the Federal Democratic Republic of Nepal bears the wounds of a nation recently torn apart by civil war. Fed up with the ever-widening gender and class disparities in Nepalese society, the Maoist political movement ignited a ten-year revolution in an effort to obtain equality for all citizens. Known as the Maoist People's Liberation Army of Nepal, this rebel army played a major role in eliminating the negligent constitutional monarchy and eventually establishing a fledgling republic. Forty percent of this rebel army were women. Woman Rebel, a short documentary directed and produced by Kiran Deol, follows the tumultuous story of one such warrior. The fortitude of these Nepalese women warriors would soon be rewarded, but not without a steep cost. By 2005--after nine years of guerilla warfare--the death toll reached a staggering 13,000 soldiers from both the Royal Nepal Army and the People's Liberation Army. The seemingly unending civil strife began to chip away at the Maoist public image. When King Gyanendra took it upon himself to dismiss the entire parliament, Maoist leadership changed tactics and allies with displaced parliament members in an effort to mobilize Nepalese citizens in a peaceful uprising. This eventually led to the king's departure and democratic elections, held in 2008. The Maoist party achieved a majority in the newly developed constituent assembly, and Silu was among them. In fact, at the time of filming, thirty-three percent of the constituent assembly were women. Woman Rebel offers a tender glimpse into the experiences of a courageous young warrior propelled into battle by her deep yearning for human rights. Set against the backdrop of turbulent governmental upheaval, this film effortlessly transitions between the personal testimonies of Silu and short explanations of the overarching events and issues that affected the entire nation. Despite the considerable struggles faced by Silu and her fellow rebels, the filmmakers do not leave viewers in a state of despair. The prospect of a burgeoning new government involving all levels of society boosts the mood, as does the knowledge that Silu and her brother are in the process of reconciliation. Viewers will find one final treat in learning Silu's actual name, but I won't spoil it for you. The SRRT Newsletter is always looking for good articles, essays, and letters to the editor. The next submission deadline is September 2, 2011. Please send submissions and inquiries to SRRT Newsletter Editor-elect Amy Honisett, indicating "SRRT Newsletter" within the subject line of your e-mail. A confirmation of receipt will be sent in a timely manner. Notification of our decision to accept or reject your submission for publication will be sent after the submission deadline. SRRT Newsletter is published quarterly by the Social Responsibilities Round Table of the American Library Association. ISSN: 0749-1670. Copyright � 2011 by the Social Responsibilities Round Table. No part of this periodical may be reproduced without permission. Editor: Myka Kennedy Stephens, mykaks(at)gmail.com. Assistant Editor/Editor-elect: Amy Honisett, ahonisett(at)yahoo.com. Book Reviews Editor: Jennifer Caldwell, Jennifer.Caldwell(at)pima.gov. Editorial Board Members: Gerardo Colmenar, Heather Edmonds, Erik Estep, Alison Lewis, and Julie Winkelstein. Views expressed in this newsletter are not necessarily those of ALA/SRRT. The editors reserve the right to edit submitted material as necessary or as the whimsy strikes.